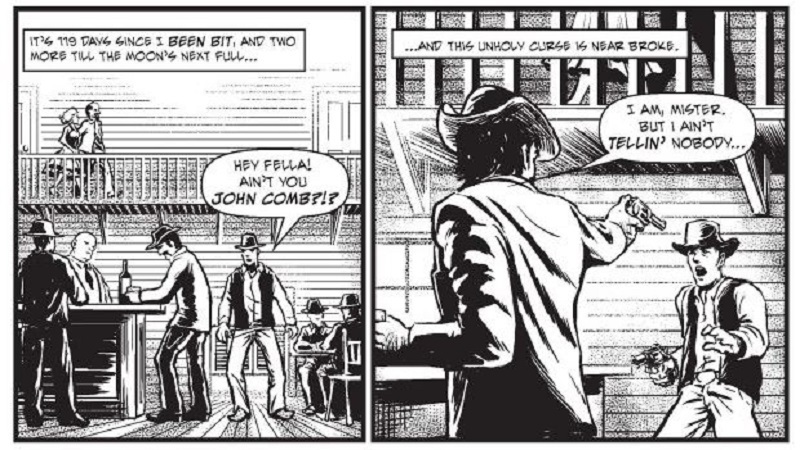 Set in the 1800’s Wild West, gunslinger John Comb is a man with a curse hanging over his head; the curse of lycanthropy. Having fallen for a prostitute named “Mona”, Comb visits the brothel in which she works. He is forced to defend his lover when she is assaulted by an irate “client” named “Jakeson”. He enters her chambers and finds the woman has been slain by a wolf-like beast, a beast that once was Jakeson. Comb guns down the monster that has slain his lover, but not before being bit by the beast in the process. 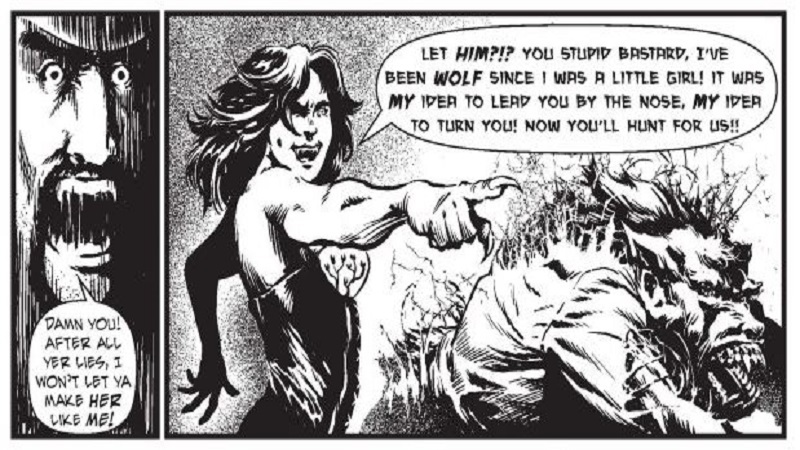 Now, Comb spends his days (and nights) tracking down Jakeson’s “sire”, the werewolf that bit Jakeson, in the hopes that slaying the man or woman will reverse his own lycanthropy. Guided by an old book of legends lent to him by a “snake-oil salesman” named “Von Strader”, Comb is led back to the cemetery where he buried his lover, as well as the man that killed her. Upon reaching the cemetery, Comb finds both Jakeson and Mona alive and waiting for him, thanks to the lycan blood running through their veins. Just as surprising is the discovery that Von Strader is there and also awaiting his arrival. Comb is dismayed to discover that every event leading up until now has just been part of an elaborate ruse designed to make him part of the the werewolf ‘pack’, one which Von Strader himself is a member of. Even his dearest Mona, whose love was just a trap set to lure Comb in, has been a lycan from before they even met. Comb must fight for his life against the werewolf trio, but easily bests them in short fashion, despite taking a silver bullet to the back. The quick nature in which Comb defeats his enemies prevents the battle from having much dynamic weight and arguably makes the issue feel more than a little rushed, even at it’s already shortened length. As the issue ends with no sense of future direction, there’s little to compel readers to look forward to further chapters. Artwork is respectable, but doesn’t stand out enough to help make up for the story’s shortcomings. Written by Jeff Rider, and featuring art by Stan Chou, Been Bit is available for free on Comixology or for $2 as a mini-comic (available at the creator’s website). As this is a very short, yet somehow still unfulfilling comic, you may want to read the free digital version first. Next Next post: Robot Monster (1953) – A Look At One of the Worst Movies Ever Made!